I just put this together and assembling is very easy! Very sturdy. I’m not done assembling but I was eager to see how they look. I will mount the other set to the wall. I think they look great! 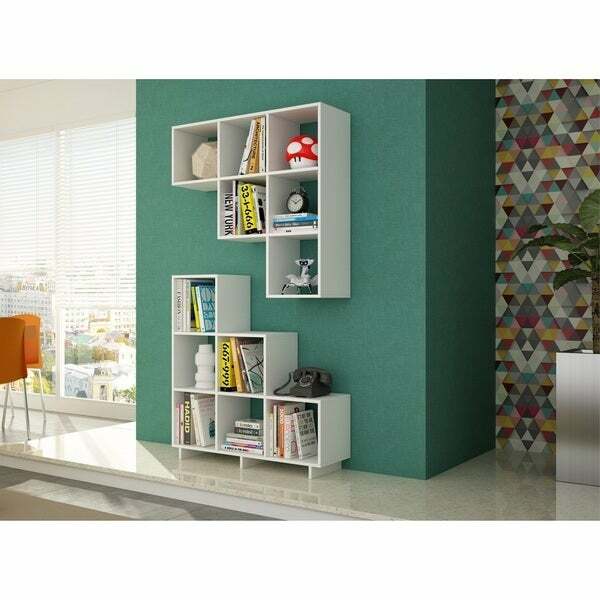 Take a modern approach to home storage by mounting this set of two cubby six-cube shelf units on a wall. Ideal for displaying family photos, travel souvenirs, or pottery, this inventive shelf unit includes hanging brackets to make installation simple. Really easy assembly and the set looks perfect in my daughters room. The only thing I noticed is that the white paint chips very easily but my kids are rougher than most. I am happy with the purchase, the price was right and they serve their purpose as a cubby/book shelf. Like these do well I ordered another set. They are just perfect for a small room. Didn’t hang them sat them on the floor. "Is the brown color painted or stained? " The brown color is painted on the wood. This is my second set. Very sturdy and looks great. "Has anyone hung this on the wall like in the picture and if so how well did it hold up?" "What size are each cube?" "Does the bottom bookshelf have any mechanism for being secured to the wall (so that it doesn't tip over if a small child pulls on it or tries to climb on it)? Thank you!"